This week you have one of my favorite runs of the season. Unfortunately for me I won’t be available to run it. Unfortunately for you I won’t be here to organize it. So…. who’s in charge? I need a few volunteers to take over the long run for the next two weeks. We need someone to coordinate (making sure water stops are covered, collecting money, paying for the water stop supplies, reminding people of the ruote) and a few people to help with water stops (buying supplies, dropping off cars, and transporting to and from Brueggers ). Â For all of those that haveÂ benefitedÂ from this program, here’s a great opportunity to give back! Enjoy these two awesome training runs! Good luck, and thanks! Despite the crazy triple digit heat over the past few days, I think we’ll hit a relatively cool spot for our run on Sunday Morning. Temperatures at the start of the run are forecast to be 75 and as long as we finish within 2 hours we’ll be back at Brueggers before it hits 80. I did check the hourly forecast to see what difference it would make if we started an hour earlier, that would be 73 degrees at the start and 79 by the finish. Not really worth the confusion. So 8AM start it is! The run will take us straight up Main St to Wakefield. The water stop will be at Nick’s Pizza at the corner of Nahant and Main St. From there the short route will turn right around and head back to Brueggers. There is a middle distance option as well, continuing up Main St to the lake, left on church, left on North to bring you back to the water stop. This addition will make the total distance 8 miles. The longer runners will leave the water stop and head up to the lake and keep on Main St to the right of the lake. A full loop around the lake will bring them back on Church St where they’ll take Common St and merge back onto Main St to the water stop. From the water stop the route will take them back down Main St to Melrose finishing the 10.7 mile run at Brueggers. As for the water stop. I’ll pick up water, gatorade, candy, and gu for this week’s run. If Brian volunteers again, I’ll drop the bucket of supplies off at his car, if not I’ll need someone to pick me up at about 7:45 and bring me back to Melrose. Post the options here and I’ll coordinate it all later tonight. So who’s in for the Sunday Long Run?! ROLL CALL!!! This week we’re running on Saturday to clear way for a nice evening of MRC Summer Partying. Yes, the Summer Party is this Saturday, so the run will be held on Saturday Morning, from Brueggers at 8AM… when our bellies aren’t full of ribs and beer. As for the route this week… There was once a Half Marathon held in Melrose, although at this point we’ve run the route much more than they did so it might be the SLR Half Marathon route by now. The route heads out the Fells, over some fun hills, to Highland Ave in Malden/Medford. From there it heads up to Spot Pond, by Flynn Rink. We take a water stop there. The shorter distance runners keep right at the pond and run the front side of the pond to Wyoming Ave. Down Wyoming Ave to Grimsby’s where they turn left to follow the Lynn Fells back to Main St and home to Brueggers. The longer runners follow the old half route to the left of the pond, down Elm St and loop the entire pond (except you’re allowed to take the shortcut through the parking lot at Straw point near Friendly’s in Stoneham. Making their way back to the water stop. After the stop they turn left onto East Border Road to an infamous hill that elicits the saltiest of swears at yours truly for picking the route. Remember, this route was a half marathon before we ran, we’re just following tradition. After the hill we turn left onto the Fellsway East through the hills we started with, past Grimsby’s along the Lynn Fells and into Melrose. Turn right on Main St and follow home to Brueggers. That’s the route. Let me know if anyone can help with the water stops. Since we’re changing the days, there is a chance I won’t be able to make it (softball to spectate), so if we can get some volunteers to set up the stop and transport people that would be good. Sometimes we even set up a water only stop at the Straw Point side of the pond too. So that’s the route and hopefully the water stops taken care of . The only thing left is to run it. Who’s in for a Saturday Edition of the Sunday Long Run? ROLL CALL! Week 1 – Back at it!!! 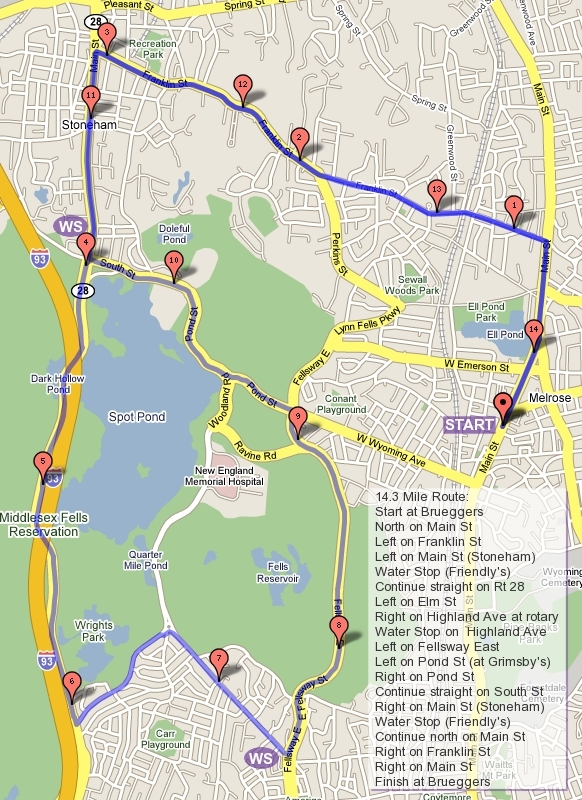 This Sunday starts the 2011 Summer/Fall edition of the Sunday Long Run. Yep, time to start training for those Fall Halfs and Marathons. I’ll be heading back out on the road and Barry is back running too so don’t expect the pampering you got through the winter/spring session. I’ll need a steady stream of volunteers to support water stops. For those new to the Sunday Long Runs take a look at the about link up in the right hand corner of the blog. This will tell you what you need to know. The SLR is not funded by the Melrose Running Club, it is a self sufficient training group of the MRC. Each week you’ll be expected to pitch in a dollar or two to support the water stop supplies. Typically if you’re running a half you pitch in a dollar, anything longer two. At first you’ll wonder where the money goes but once we get rolling and the treats start showing up to help you get through the run you’ll realize you’re getting your money’s worth. If you feel like paying once for the season you can donate $30 if you’re training for a marathon, $15 if you’re training for a half. This week’s run will be heading over to the Lynn Fells, out to Main St in Saugus. For those running short you’ll turn and head back on Howard St for 4+ Miles, those running longer will make your way over to Wakefield High School for a water stop. After the stop you’ll continue on to Water St where you’ll head right. Water will take you to Main where a left will bring you back to Melrose. So post here if you’re in for this season, if you’re in for the run, and/or in for the water stop support.